Maintaining and cleaning your air-conditioner condenser unit on a regular basis is the best way to ensure the unit will remain reliable and efficient throughout its years of service. Luckily, these units are easy to keep clean throughout the year. The small amount of time taken for cleaning can prevent a lot of inconvenient and costly repairs down the road. 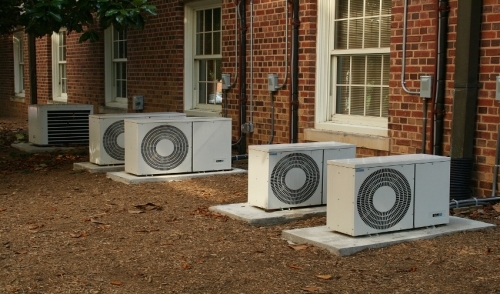 For central air conditioning systems, the condenser unit is the portion located outside of the home. Its function is to disperse the heat that accumulates inside the home, and in doing so uses a fan that moves air across the coil and coil fins. Over time, debris, dust and other materials can accumulate on the fins thus reducing the efficiency of the condenser. Depending on the environmental conditions of your area, this debris can accumulate more rapidly. Things like leaves, dandelion fuzz, and grass can accumulate in a surprisingly short amount of time. Cleaning the condenser unit only requires a few simple tools, most of which you probably already have. A good vacuum cleaner (preferably a shop vac), screwdriver, long handled brush, and a couple rags are all you’ll most likely need. This is also a good time to change the air filter on the inside unit, so purchasing one of them ahead of time is also a good idea. Once you’ve gathered your tools, make sure that you shut the power off to the unit. This could either be located in a small box next to the machine or a dedicated breaker inside the home. Begin with cleaning any fins or vents around the unit. Vacuum any easily removed material that you see. The more difficult debris can be loosened carefully with a brush, going up and down the fins. Try to avoid bending the fins as this will restrict airflow and hinder the unit’s effectiveness. Also inside the unit is the condensing coil. It is important to keep this clean and free of dust. Light accumulations can be removed with a soft brush or lint-free cloth. While cleaning, keep an eye out for drops of fluid beneath the condenser. This could indicate either an oil or refrigerant leak. If you find that this is the case, you should call a professional to remedy the problem. If everything looks okay and the unit has been cleaned, you’re now ready to turn it back on. Once the unit is running, stay near and listen for any noises that might indicate a problem. Once it has been running for a few minutes, pull back on the insulation surrounding the pipe. If everything is working properly, it should feel cool. The other pipe should feel warmer than the first. If this is not the case, then you might need to have your refrigerant level checked. It’s easy to overlook appliances such as these while they are running fine during the course of the year. Regardless, it is good to invest in regular checkups so that the high cost of repairs or replacement can be avoided in the future.